Photo: Children at one of our homes prepare to go to school where they are happy to have the chance to receive a quality education. Bringing you a great report from Myanmar, we’re glad to announce that we wrapped up a successful school year in March. All 130 of our orphan students finished with good scores on their final exams. The children studied Burmese, English, geography, history, math, and science. In addition to donations made by our orphan sponsors, our children’s education is made possible by profits from our 12-acre farmland project and on-campus gardening projects. Our farmland enterprise produces several tons of rice each year, and along with our gardening projects, our native team in Myanmar is able to serve over 400 meals each day to orphans and staff in our six orphan homes in the country. However, during special times of the year, we need your support to pay for one-time needs that arise, such as our back to school season in June, when we must provide school supplies for these 130 children. In further good news, many of our students finished the school year with academic awards and special honors — we want to share 3 of their stories with you today. One we want to highlight is 8-year-old Mai. Before she came to live with us, she lived in the Kachin state where her father died when she was 4 years old and her mother could not support her or provide what she needed for school. A kind, local woman told Mai’s mother about our programs, and Mai came to live with us 4 years ago. When she first arrived, it was difficult for her to follow the subjects and attend classes for the first time. But she advanced quickly and learned to follow all of the subjects easily. Many of her classmates initially looked down on her because she did not have good speaking skills in the classroom, but she quickly overcame this adversity and now her classmates are good friends who respect her. Mai’s favorite subjects in school are Burmese and science, and when she’s not studying, she loves to play games, jump rope, dance, and sing. This year Mai received an academic excellence award for 3rd grade, and she will advance to 4th grade when the next school semester begins in June. Mai says she wants to become an engineer so she can design better orphan homes. She is very thankful and happy to now have a quality education and live safely in one of our orphan homes where she has many friends and receives nutritious meals, including her favorite foods, like fish and her favorite fruit, bananas. Her prayer requests are to have good health, continued academic progress, and a successful life. Photo inset: (Top-left): A boy in one of our orphan homes enjoys a nutritious meal provided by our native team’s farmland enterprise. (Top-right): Mai, who lives in one of our Myanmar orphan homes, recently received an academic excellence award for 3rd grade. 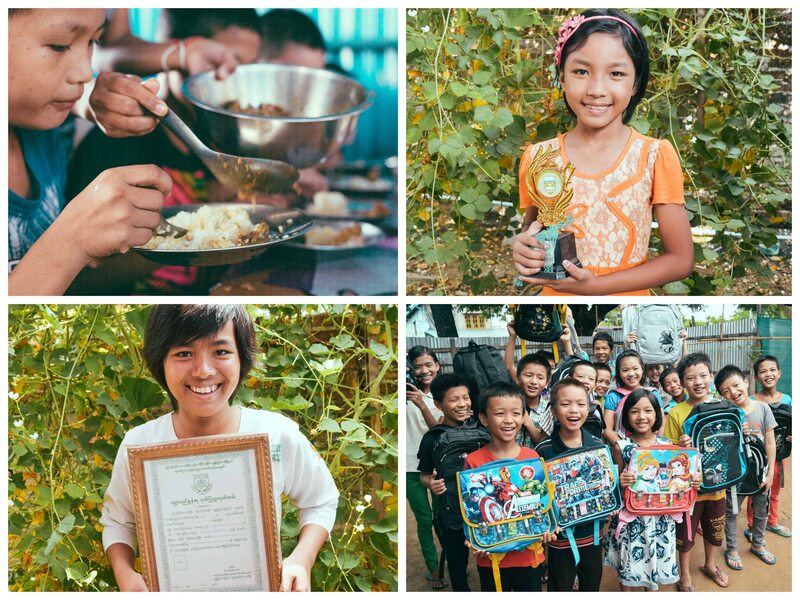 (Bottom-left): Sixteen-year-old Naing received an academic excellence award for the 9th grade this year. She came to live in one of our orphan homes 8 years ago. 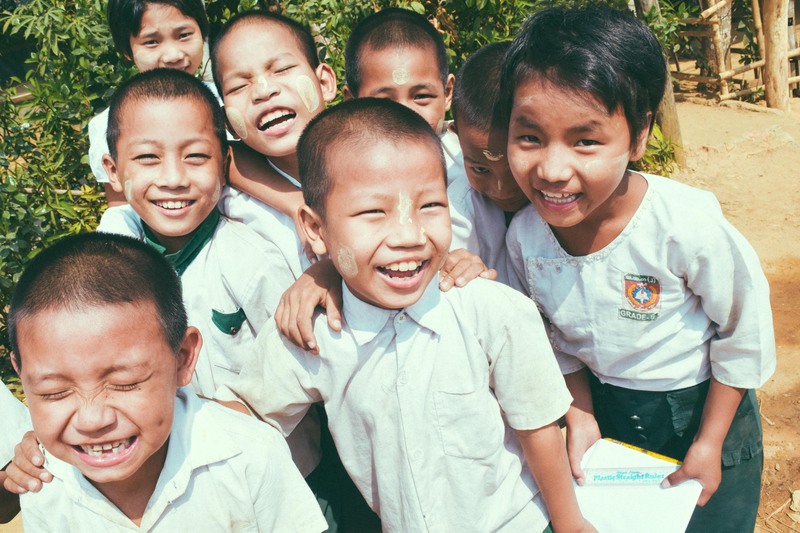 (Bottom-right): Each year we provide all of our 130 Myanmar orphans with school supplies. Another student we want to share about is 17-year-old Manak. Before he came to live with us, he lived in a remote rural village where his father died from cancer when Manak was very young. He has a brother and 2 younger sisters and his mother was unable to support his academic and nutrition needs, so she sent him to live in one of our orphan homes 10 years ago. When he first arrived, having no education background at all, it was very difficult to adjust to school. But he progressed and has learned to follow most of the subjects easily. Now in the 10th grade, he says that his most challenging subject is math, but he has excelled in all other subjects and it turns out that he’s a very talented illustrator. Manak’s favorite subjects are Burmese and geography, and when he’s not studying, he likes to play football and other games. Manak was very proud and thankful to receive a sports excellence award this year. He is very thankful and happy to receive a quality education and live safely in one of our orphan homes where he has a large family of support and receives nutritious meals. Manak’s prayer requests are to have good health, do well in academics, and to graduate from high school. We’re also happy to celebrate 16-year-old student Naing’s achievements this past school year. Before she came to live with us, she lived in a small village in the far north of Myanmar, where her father died when she was 8 years old. Her mother, struggling with extreme poverty, could not provide for her needs, so she sent Naing to live in one of our orphan homes 8 years ago. When she first arrived, it was difficult for her to follow the subjects, but she progressed well and learned to pursue her studies with enthusiasm. Naing says her favorite subject is history and that she enjoys playing games, dancing, singing, and cooking at the home. This year we are so proud to report that Naing received an academic excellence award for the 9th grade, and will advance to 10th grade in June. She says she wants to be a school teacher when she graduates so that she can be an inspiration to the next generation. Naing’s prayer requests are to have good health, to excel in her academics — especially passing 10th grade next year — and to live a life that blesses others. We are grateful for success stories such as Mai’s, Manak’s, and Naing’s because due to the adverse effects of extreme poverty and the health crisis in Myanmar, countless children are left orphaned, often suffering from dietary deficiencies, child prostitution, human trafficking, hazardous labor, and domestic slavery situations, or being recruited as child soldiers by the military junta, which has governed Myanmar since 1962. In Myanmar, many children are employed in factories, teashops, and other businesses where they work long hours under exhausting conditions for very little pay. Other children take to the streets to beg and others run afoul of the law. Despite these challenges, there is reason for hope. Peace Gospel’s orphan homes in Myanmar act as healing spaces of refuge, offering orphans family-style nurture where they can find security, love, and a path that lifts them out of the vicious cycle of poverty. Together with your help, we’re able to provide these bright children a loving home centered on the Biblical truths of God’s love and hope. We are continually thankful for your steadfast prayers and generous support making the work that we do for these children possible.